Will Dems Also Applaud Ivanka's Women’s Global Development and Prosperity Initiative? Ivanka Trump is excited to be unveiling a new effort intended to empower women in developing countries. The Women’s Global Development and Prosperity Initiative, Trump explained in a new op-ed for the Wall Street Journal, has an ambitious goal of helping "50 million women in developing countries realize their economic potential by 2025." It will focus on the development of vocational education, entrepreneurship, while also working to remove "legal, regulatory and cultural barriers" to women getting involved in their local economies. President Trump plans to sign a memorandum to establish the W-GDP Thursday afternoon. Prominent female leaders gave Ivanka kudos for her new effort. The Job Creators Network also didn't hesitate to applaud Trump's effort. "We applaud the President for recognizing the importance of empowering women throughout the world," the group said in a new statement Thursday. "Thanks to his economic initiatives here at home, we have more women in the workforce than ever before and millions of women-owned small businesses are prospering." "The importance of advancing workforce development and vocational education for women worldwide cannot be overstated. 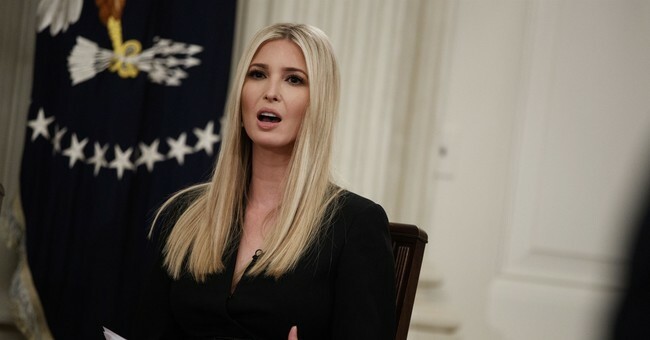 As a businesswoman, Advisor to the President Ivanka Trump has seen firsthand how vital it is to ensure that legal and cultural barriers for women are lifted and equal opportunity is made available in developing countries. We look forward to working hand in hand with Ms. Trump to spread the fight for free enterprise to 50 million women across the world by 2025." I've yet to see Democrats come out and support the bipartisan campaign, but I hope that will change. After all, they did stand and cheer at President Trump's mention of all the female success in Congress at the State of the Union Tuesday night. More women are serving in Congress than ever before, and women claimed 58 percent of the newly created jobs last year. In a new video message, Ivanka suggested that female lawmakers cheer their efforts to empower women abroad, as well as at home. Today, @IvankaTrump is launching the Women's Global Development and Prosperity Initiative—or W-GDP.